Imagine that your car could talk. Consider how easy it would be to care for that vehicle if it were able to tell you anytime something was wrong with it, or that it had concerns about its own well-being. Considering that many drivers lack advanced automotive know-how, it’s easy to appreciate just how much that would simplify vehicle maintenance. But here’s the thing: your car can talk. It already tells you when something is wrong, or when it’s concerned about its own well-being. How? Through its dashboard ‘Warning Lights’ or ‘Vehicle Warning Indicators’ (VWI). But it’s important to realize that VWI are far from universal. First, one can expect differences in the warning lights based on both make and model. Slight nuances in design language come into play as well. That said, it’s important to familiarize yourself with the warning lights in your vehicle, as presented by the manufacturer in the manual (or in online reference materials). For the sake of this article, however, we’ll explore some of the most common VWI – and what your car, van, crossover, SUV or truck is trying to tell you if any of these bright, amber or red lights happen to make an appearance. Arguably the most infamous and unwelcome of VWI, the Check Engine light (or ‘Malfunction Indicator Lamp’) is bound to put a damper on anyone’s day. In fact, the MIL moniker is probably more accurate since an illuminated MIL might not mean an issue with the engine itself. In fact, it could be caused by something as simple as a loose gas cap, or something as costly as the need to replace a catalytic converter. It’s also not uncommon for an untrained eye to confuse the MIL with the ‘Service Vehicle Soon’ VWI. We’ll get to the latter further on, but the MIL is certainly deserving of immediate attention to determine the issue at hand. Regardless of the issue, a garage or dealership will be able to run a diagnostic check-up, confirming the issue by detecting a diagnostic trouble code. These codes, made standard in all vehicles in the mid-90’s, formed a consistent bridge between all automakers. Diagnostic readers are available for purchase at the retail level as well but are only helpful in the hands of someone with the automotive skillset to interpret the data and act as needed to fix the issue. And remember, a vehicle with an illuminated MIL will be ineligible from earning its required state inspection sticker. Considering an estimate that 10% of all cars on the road (at any time) have an illuminated MIL, some of them might find that reminder useful. Maintaining the operational temperature of a vehicle is crucial, based on the immense amount of heat generated by the combustion engine. This is why a number of systems exist within a vehicle to circulate coolant through the engine block, ensuring a cool and controlled temp. Thus, the illumination of a Coolant Temp VWI indicates that there the vehicle’s temperature is running too warm, due most likely to diminishing coolant levels (possibly from a leak), or an issue with the radiator or fan. In the event that this light goes on, the most prudent step is to pull over and allow your vehicle to cool down. In the event that you’re a layperson, it would be most prudent to call for help, either from a professional or trusted party. Either way, the coolant levels should be checked alongside all other components of the coolant system. As with coolant and oil, transmission fluid must also be maintained in terms of temperature and viscosity. This ensures that your transmission maintains optimal operation, shifting seamlessly as needed. But whereas oil ‘burns off’, transmission fuel does not. If you’re overheating, a Transmission VWI is probably indicating an issue with your lubrication system. The issue could be a leak or break within the system, caused by hot weather, stop & go traffic or neglect. Understanding that most normal transmissions operate at 175 degrees or below, a Transmission VWI indicates that you are now operating in excess of 250 degrees. Considering that this could result in a wide range of repairs, from affordable to costing in the thousands of dollars, heed the warning and make sure your vehicle receives immediate attention. Normally red in color, the Oil Pressure lamp is intended to indicate a pressing issue with your motor oil. Such issues include, but are not limited to (i) diminished oil levels (ii) low oil pressure (iii) a fault within the system, restricting circulation or (iv) the need to replace your oil pump. Pull over. Turn off the engine. Remember that your vehicle requires motor oil to lubricate the numerous moving parts within the engine. Without sufficient lubrication, those metal components continue to run at high speeds, rubbing against one another, with little-or-no protection from wear. This could lead to full engine seizure and the costly need for engine repair, or replacement. The ability to check one’s oil level might be among the most crucial tasks, manageable by even the most unskilled of drivers. Along with the ability to pump one’s gas, check air pressure and change a tire, the ability to check / add oil might prove a lifesaver one day. Either way, a vehicle with a persistent oil pressure warning light should be reviewed by a professional before being driven any significant distance. While we recommend that you rely on duration (3-6 months) or mileage (3,000-6,000 miles) intervals to schedule oil changes, some vehicles are equipped with an “Oil Change Reminder’ VWI. That said, we don’t recommend reliance upon this light, or the assumption that your vehicle is equipped with one. Your vehicle contains a rechargeable 12-volt battery which powers all electrical components. From headlights to the radio, ignition to the computer which regulates the engine itself, your vehicle’s operation is reliant upon the battery. As such, vehicles are equipped with an alternator and voltage regulator. These ensure that the battery remains properly charged at all times. Thus, a battery VWI indicates that the recharging of your battery isn’t occurring in the manner, or at the strength required for continued operation. Failure to identify / address the issue will lead to the vehicle driving until the point that the battery can no longer sustain it. By far, the least critical in terms of risk of damage to your vehicle, a dead battery can prove just as convenient if you find yourself left stranded. An illuminated brake light could simply be a reminder that your parking brake is engaged. Should it remain illuminated once you’ve confirmed that the parking light is disengaged, it could mean that your braking systems low on fluid, or that you have a more serious issue. Needless to say, the safe operation of any motor vehicle is reliant up its braking system. Thus, any VWI should prompt an immediate trip to your dealership, garage or service center. The TPMS is a great example of how modern technology has made a task (in this case, monitoring one’s tire pressure) immensely more simple. Proper tire inflation is crucial to your vehicle’s handling, ability to carry loads, disperse water and reduce its rolling resistance. Granted, issues can result from both under and overinflation that will affect tire longevity and overall safety. That said, the TPMS VWI will only illuminate in the case that your pressure is too low. Heed the warning, and take the first opportunity to restore the required tire pressure in all tires. And while the TPMS is a helpful warning system, it should never replace the manual act of regular tire pressure checks. Remember, sensors can malfunction. Beginning in 2012, traction control was made a standard feature in all vehicles. Working in conjunction with the antilock brake system, it creates the foundation of the vehicle’s stability control. The Traction Control regulates traction during acceleration while the ABS does the same during braking. In the event of seasonal driving (ie: winter road conditions) or excessively wet roads, traction control is crucial to continued and safe operation. As such, failure to identify (and fix) a faulty system could prove dangerous. 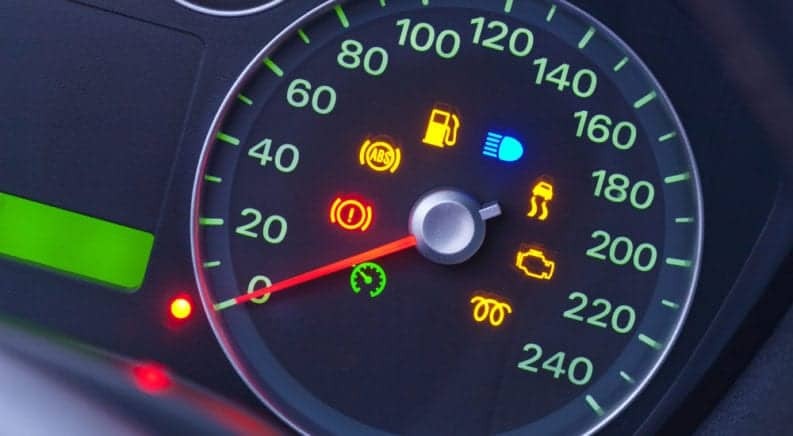 While these are only a handful of the Vehicle Warning Indicators that exist in your dashboard, they are among the most significant and the most critical. Here at CheckEngine.com we’ll continue to explore each in more depth, as well as those we didn’t cover as part of this article. Our hope is that we can improve the manner in which your vehicle communicates with you, and the manner in which you respond to your vehicle. Is there anything you’d like to know more about here at CheckEngine.com? Let us know, and we’ll be glad to help.